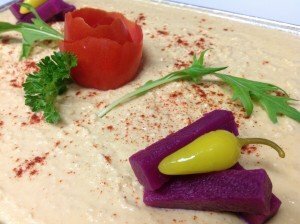 Saca’s Mediterranean Cuisine offers a great selection of Mediterranean catering menus for your office meetings, parties and celebrations. 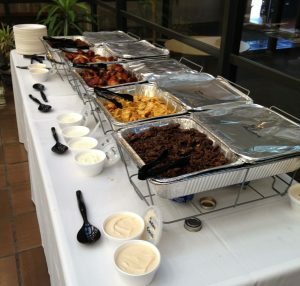 All our catering menus are easily sizable to meet your needs. We also offer individual Lunch Boxes. Our menus include vegan, vegetarian, gluten-free and dairy-free dishes to satisfy your guests’ special diets. Our dishes are served with Saca’s Signature Sauces. We also package every dish in recyclable carrying boxes designed to prevent spillage and keep your food at the right temperature. To request a quote, check our Mediterranean Catering menus and fill the form below. You will receive a detailed quote within 24 hours. Orders must be confirmed 24 hours in advance. If you are looking for a mix of appetizers, this is your best choice. 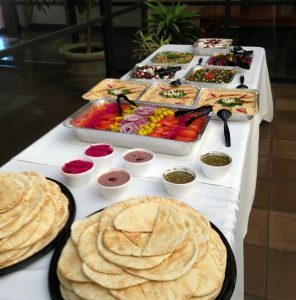 Saca’s Snack Party offers an assortment of Saca’s Best Signature dishes: Falafels, Hummus, Pickled Turnips, Mediterranean Salad, Baba Ghanouj, Dolmas, Tabouleh, Greek Salad or Feta Cheese and Olives, served with Fresh Pita Bread. This is the ideal choice for an office meeting or to feed the entire Soccer Team. Our Sandwich pack offer a few appetizers and a variety of Pita sandwiches individually wrapped and easy to eat on the go. 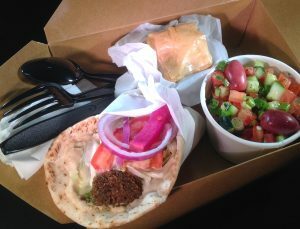 Sacas’s Lunch Boxes include a Pita Sandwich, a Cup of Salad (Mediterranean or Tabouleh), a Walnut Square Baklava, utensils, salt/pepper and napkin. The choices are plentiful: we can make vegan, vegetarian or dairy-free boxes. Min. order 10 boxes. 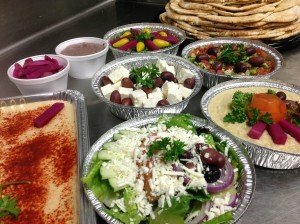 Looking for an all Vegetarian Meal, this is a great option that combines warm dishes (Falafels, Rice Pilaf or Grilled Veggies) and Salads and sides (Hummus, Mediterranean Salad, Baba Ghanouj, Dolmas, Tabouleh, Greek Salad, Feta Cheese and Olives, Oregano Chicken Salad, fresh Pita Bread). Most dishes are also gluten free, dairy free or Vegan. A wonderful opportunity to feast on Saca’s Rotisserie Chicken and Signature Dishes. 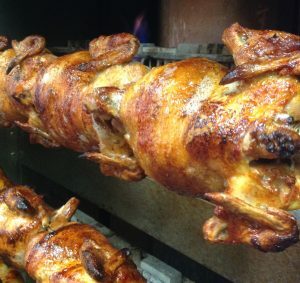 Our chicken are delicately seasoned before being roasted to perfection and served with Garlic Sauce and a choice of several Signature dishes including Falafels, Rice Pilaf, Grilled Veggies, Pickled Turnips, Kalamata Hummus, Mediterranean Salad, Baba Ghanouj, Dolmas, Tabouleh, Greek Salad, Oregano Chicken Salad or Feta Cheese and Olives. Saca’s Mediterranean Feast will satisfy both Vegetarian and Non-Vegetarian guests. Saca’s Pita Party is a Festive Option to entertain and delight your guests. 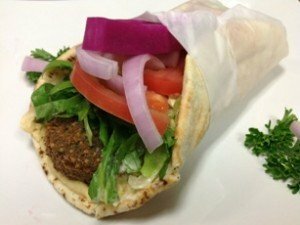 With a choice of up to 3 Shawerma meats (Chicken, Beef and Lamb), your guests will have an opportunity to design and assemble their own Pita Sandwich and complement it with the Signature Dishes and Side of their choice (Falafels, Hummus, Rice Pilaf, Grilled Veggies, Pickled Turnips, Kalamata Hummus, Mediterranean Salad, Baba Ghanouj, Dolmas, Tabouleh, Greek Salad, Oregano Chicken Salad or French Feta Cheese and Kalamata Olives). Saca’s Grand Feast offers our largest selection of Meat (Rotisserie Chicken, up to 3 Shawerma Meat or Laban Chicken) and Signature Dishes (Falafels, Hummus, Rice Pilaf, Grilled Veggies, Pickled Turnips, Mediterranean Salad, Baba Ghanouj, Dolmas, Tabouleh, Greek Salad, Oregano Chicken Salad or Feta Cheese and Olives).